This color reamer top is very hard to find. 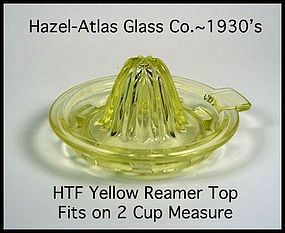 It was made in the 1930's by The Hazel Atlas Glass Co. and sat on top of a 2 cup Mixing and Measuring pitcher. It is in excellent condition! 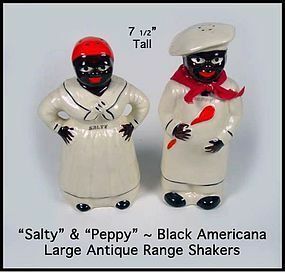 You are buying a pair of vintage black Mammy & Chef stove top range shakers. They say "SALTY" on the lady character, and "PEPPY" on the chef character. Condition is excellent except for a tiny paint nik on the back of the head in the hair area of PEPPY, and I do mean tiny. There is also a 3" brown line on the back of PEPPY'S leg. The paint is very bright and shiny, and PEPPY still has his original neckerchief. 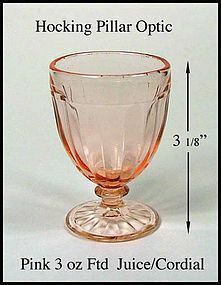 This pink Pillar Optic footed tumbler was made by Hocking in the 1930's and it is in excellent condition! 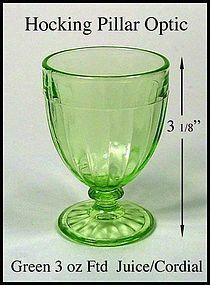 It holds about 3oz and is called a juice/cordial tumbler. We have 6 of these available for $10.00 each. 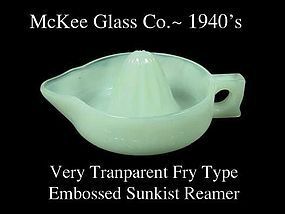 This opalescent swirly Fry Glass style Sunkist reamer is in excellent condition! Has some very transparent parts in the glass and handle. 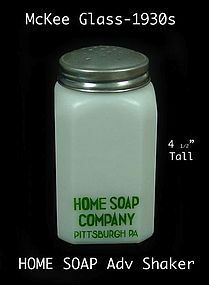 This 1930s HOME SOAP advertising shaker was made by the McKee Glass Co. It is in excellent condition! 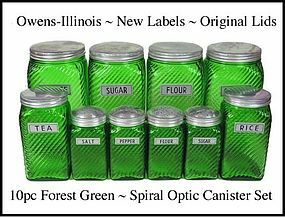 This forest green spiral optic 10 pc canister set was made by Owens-Illinois in the 1940's and is sometimes called Ruff and Ready. 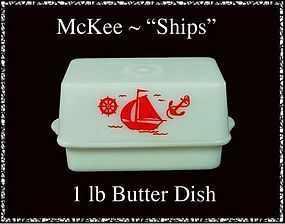 The labels are new, and the original lids are in good condition with easy on, easy off. They may have a ding or two, here and there, but nothing major. 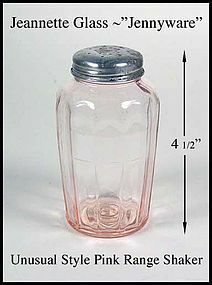 We also have other O-I jars, so please check our list. 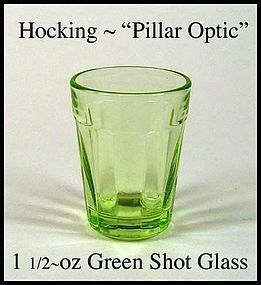 Pillar Optic green 1 1/2 ounce shot glass in excellent condition. 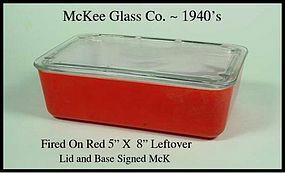 Made by Hocking Glass in the 1930's. 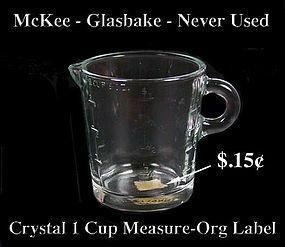 There are 2 shots available @ $10.00 each. 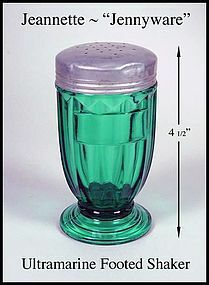 a vintage McKee jadeite PEPPER shaker. Bold block lettering, square shaker. Excellent condition with no damage, no repairs, little wear. 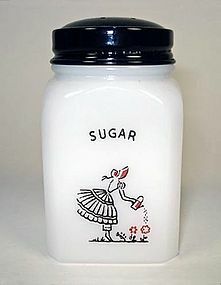 Lid is original to the shaker, and in very good shape. 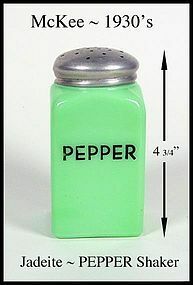 Stands 4 3/4 inches tall to the top of the lid. Seems to have seen very little use, and would make a nice addition to your collection, or country kitchen. 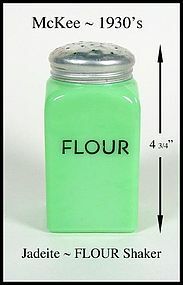 a vintage McKee jadeite FLOUR shaker. Bold block lettering, square shaker. Excellent condition with no damage, no repairs, little wear. 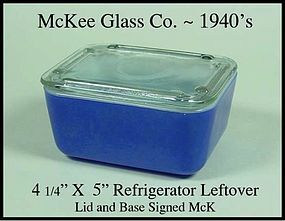 Lid is original, and in very good shape. 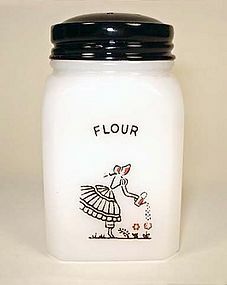 Stands 4 3/4 inches tall to the top of the lid. Seems to have seen very little use, and would make a nice addition to your collection, or country kitchen.